Track signups have been re-opened but MUST close by midnight tonight, on Friday, March 22! All payments and paperwork including physicals are required for students to be able to participate. Click here to view letter to parents and guardians that was distributed at the Thursday meeting to track students. 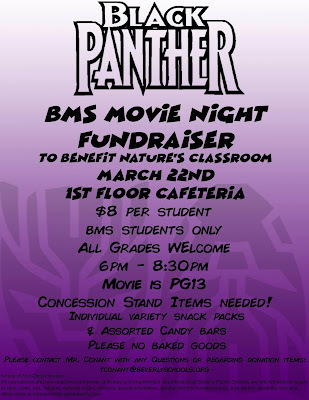 Attention BMS Families! Our first ever movie night is Friday 3/22 from 6-8:30pm. This event is for BMS students only, in all grades. Spread the word. 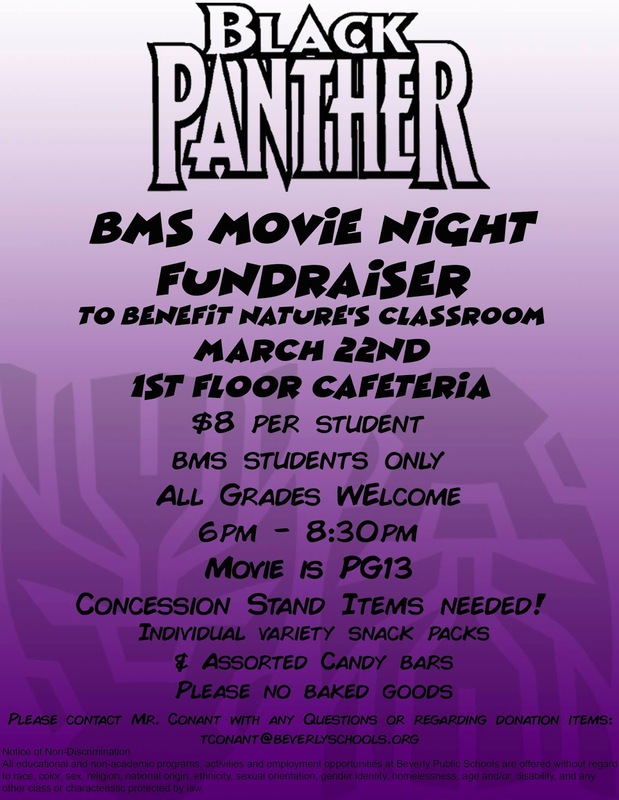 We'll be showing Black Panther, and we'll have a concession table and other treats! See this flyer in larger format for more information. Big Buck$ winning continues -- there are still lots of great prizes left to win in the month of March! The winner for Friday 3/22 is Carrie Tracey! The seller was Aidan Butterfield. Aidan can pick up his $10 seller prize in the office. There's still another week of great prizes to come. On Monday we will draw winners from the weekend. The ordering window for the Inaugural Beverly Middle School Yearbook is about to close! There are three Open Houses in March for grade 4 parents and their families to learn more about Beverly Middle School and to tour the building. All of these events will start at 6:30 pm in the BMS Auditorium at the back of the school. The winner for Thursday 3/21 is Chantell Janvrin! The seller was Alana Janvrin. Alana can pick up her $10 seller prize in the office. Mr. Hecox is cancelling the musical rehearsal this afternoon due to the pasta dinner fundraiser for the music department. The rehearsal that would have taken place today will take place on Monday 3/25. Please check the rehearsal schedule and feel free to email Mr. Hecox with any questions at mhecox@beverlyschools.org. There are a number of families that have requested financial assistance for the 8th Grade Boston Trip. To maximize our fundraising efforts, we will raffle off three THEME BASKETS at the Staff vs. Student basketball game on April 4th. Teachers will be accepting items through this Friday, March 22nd. Students will have an opportunity to view baskets and purchase raffle tickets (50 cents per ticket) during lunch April 1-4, and tickets will be on sale at the basketball game. We will raffle off all three baskets at the game! Students can bring items to their teachers or to Ms. Norton, or parents can drop items off in the main office. There will be an informational meeting TODAY, Thursday 3/21, for those who have registered for spring track and field to go over expectations and to give out schedules. The meeting starts at 3:15 today (Thursday) in the 3rd floor cafeteria and will be done in time for students to take the late bus home. Practice is scheduled to start the week of April 8th. If you have any questions, please contact Coach Arsnow at earsnow@beverlyschools.org, Coach Rothblatt at erothblatt@beverlyschools.org, or Coach Sherman at asherman@beverlyschools.org. The All City Band Concert, featuring bands from 4th through 8th grade and the BHS Band will perform at the Beverly Middle School Auditorium on the evening of Tuesday, March 26. Students performing should plan to arrive that night by 5:30. The concert begins at 6:30 pm. The winner for Wednesday 3/20 is Gene Wong! The seller was Evan Wong. Evan can pick up his $10 seller prize in the office. There will be an informational meeting tomorrow, Thursday 3/21 for those who have registered for spring track and field to go over expectations and to give out schedules. The meeting starts at 3:15 tomorrow in the 3rd floor cafeteria and will be done in time for students to take the late bus home. Practice is scheduled to start the week of April 8th. The Beverly Public Library has a teens-only Pizza & Movie afternoon on Thursday, March 21 starting at 3:45pm with Fantastic Beasts: Crimes of Grindelwald. The Beverly Recreation Department has some openings in all sessions of Acme Fun Camp, for children entering grades 3-5. Click here to see a flyer or go to www.bevrec.com for more information or to register. Beverly Youth Football and Cheerleading registration is now open! Beverly youth football and cheerleading programs are for children in grades 1 - 8. The football season begins August 31 and the cheerleading season begins on July 1. Both run through the end of November. Click here to see a flyer for Beverly Youth Football and Cheerleading. Registration is now open for a FREE Beverly Youth Football clinic that will be held on June 8 from 10 am to 1pm, with Beverly HS Football. Click here to see a flyer about the clinic. Go to www.beverlypantheryfc.org to register or for more details. There will be an informational meeting this Thursday 3/21 for those who have registered for spring track and field to go over expectations and to give out schedules. The meeting starts at 3:15 on Thursday in the 3rd floor cafeteria and will be done in time for students to take the late bus home. Practice is scheduled to start the week of April 8th. The winner for Tuesday 3/19 is Dianne Militello! The seller was Tim Militello. Tim can pick up his $10 seller prize in the office. The tentative date for Grade 8 Recognition Night events is Friday, June 14. Please refer to this document for more important dates to be aware of as we begin the final trimester at the middle school for our 8th grade students. Some students and parents/guardians have begun asking about proper attire. Please assist us as we focus on this annual age-appropriate function. This is a school event and only proper attire will be allowed. Suggestions for boys would be a shirt & tie with slacks and comfortable shoes; sneakers are discouraged. Boys may wear a suit but should think about comfort. Suggestions for girls include pants, capris, skirts, or sun dresses. Dresses and skirts should be of appropriate length and shoes should have a lower heel. Strapless dresses, semi-formal wear, and long gowns are not appropriate for an event such as this. Kestrel Educational Adventures and Endicott College are collaborating to bring an after-school Conservation Club to Beverly for students in grades 5-10. It will be held on Wednesdays from 3:30-6:30 starting March 20 at 9 May Street in Beverly. Transportation from Beverly and Salem schools is available. Students will work together to choose a project that will help people and the local environment. Click here to see flyer with more information and/or contact Jessica Kagle: jessica@kestreleducation.org, (617) 290-2258. The winner for Saturday 3/16 is Mary Lister! The seller was Joshua Sidmore. Joshual can pick up his $10 seller prize in the office. The winner for Sunday 3/17 is Patsy Wakeham! The seller was Allison Marino. Alison can pick up her $10 seller prize in the office. The winner for Monday 3/18 is Dan Holway! The seller was Hayden Holway. Hayden can pick up his $10 seller prize in the office. Fab Lab (session 3) will meet tomorrow after school from 3 to 3:45 in room 316. Registration is now open for New England Sports youth programs, including flag football, basketball, dodgeball, and indoor street hockey. Join the Beverly Teachers Association (BTA) for a community conversation on school funding on Thursday, March 28 from 6:30 to 7:45pm in the Beverly Middle School Library. Light refreshments will be served!